The state and federal governments own the bulk of Alaska’s public lands, and large tracts of public land are open to hunting. These include some of the land in National Preserves administered by the U.S. Department of Interior/National Park Service and nearly all National Wildlife Refuge, National Forest, and Bureau of Land Management lands in Alaska. Not all public lands are open to general hunting, however. 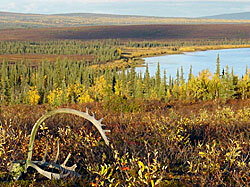 Some National Parks are open to hunting only by qualified rural Alaska residents. For more information about land ownership and public access see page 8 of the Hunting Regulations. A hunter has the personal responsibility to make sure he or she can legally hunt in their chosen area. If you hunt public lands and need maps showing public property boundaries, contact the Alaska Public Lands Information Centers (APLICS) for additional information. Many good hunting areas in the state are privately owned, and hunters must obtain advance permission to hunt in these areas. Regional or village native corporations hold most of the privately owned acreage. Numerous private holdings also exist along Alaska’s limited road system, especially near larger population centers. Specific information is best obtained from landowners. As in other states, some private landowners may charge a fee to enter and hunt on their lands. The federal government is increasingly regulating hunting on some federal public lands because of differences between state and federal laws relating to subsistence use of wildlife. Regulations shown in the current Alaska Hunting Regulations are the best authority regarding hunting opportunities on state and private lands. On some federal public lands, federal regulations may be more restrictive than state regulations covering the same area. Federal hunting regulations can be obtained from APLICS. Please note: If you will be hunting with a guide or using the services of a transporter, they should have a good working knowledge of land ownership in the area where you will be hunting. However, you are ultimately responsible for knowing the status of the land where you will be hunting – and ensuring that you have all required permissions.